BenQ has unveiled five new classroom display products designed to enhance learning and conserve energy. The products include three new projectors, an interactive flat-panel display and BenQ's first-ever audio product, a portable Bluetooth speaker. BenQ America National Education Sales Manager Patti Postel said the company's latest series of classroom IQ solutions will provide greater bring-your-own-device (BYOD) collaboration, lamp-saving technology and simple file sharing apps that should enhance teaching plans. The MX723 projector features 1,024 x 768 resolution with 3,700 lumens and 13,000-to-1 high contrast ratio. It offers vertical and horizontal keystone correction as well as zoom functionality. With its SmartEco mode, the projector can automatically adjust lamp power by up to 70 percent in brightness, resulting in as much as 5,000 hours of lamp life. The ultra-short-throw MW853UST+ has 10,000-to-1 contrast ratio and 3,200 lumens of brightness. It is compatible with BenQ's PointWrite technology that allows up to four participants to collaborate simultaneously on screens as large as 120 inches. 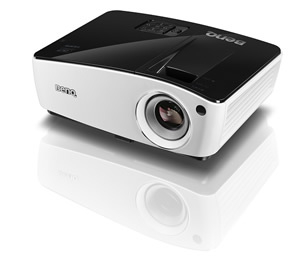 The projector is also equipped with 3D, PC, dual HDMI and Blue-ray connectivity along with double 10-W speakers. The HC1200 projector provides improved color precision that can compete with almost any other projector on the market, according to Postel. With 100-percent sRGB color accuracy and twice as much ANSI contrast as most LCD projectors, the HC1200 can reproduce images as bright as 4,000-lumen projectors. The new 70-inch RP702 HD interactive display provides 10-point multi-touch technology that allows it to perform much as a giant tablet, with responsive feedback and more accurate positioning by way of panning, zooming and scrolling. The display has low blue light technology, allowing for more comfortable viewing and anti-glare glass that reduces image interference and screen reflection. Finally, BenQ's first audio product, treVolo, is an electrostatic portable Bluetooth speaker with a collapsible wing design and bidirectional sound reproduction through three audio profile modes. Its electrostatic panels deliver audiophile-grade quality and tonal balance. Postel said, "We're keen on bringing the most advanced classroom display solutions to enable schools to provide enhanced interactivity and immersive learning experiences for students."